Courtesy of here, thank you. I just wanted to take a quick look at something like this and try to unpack how my judgement/ taste comes to affect an understanding of this. Taste by definition is about having a liking or partiality for something or seeing a level of excellence, sublime-ness in a thing or object. 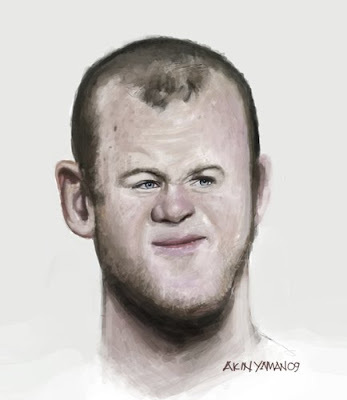 So I look at this image of Wayne Rooney - poor under-appreciated Wayne - and it grates with me on a visual level, because perhaps I think that the artists painterly affectation coupled with Pub landlord charicaturing is a gross and unnecessary fusion of visual language [I can rationalise my distaste because of my education and training]. Perhaps I am equally annoyed by the benign nature of the image, where is the biting satire? [being currently deeply annoyed at the greed of the Rooney's and their representation, so my taste is viewed through a political lens as well]- the soft focussing which makes a virtue of the odd proportions and the curiously idiotic expression - I pity Wayne because he has not had the advantages, educationally, that I have. Perhaps I secretly think that I am better than him? - so this is an issue of class, my distaste for this image is fuelled by a sense of superiority despite his millions.